First, a brief historical overview. In classic segmentation the goal was to assign every pixel in an image to one of K labels such that distinct objects receive unique labels. So ideally an algorithm would generate separate segments for your cat and your couch and pass these on to the next stage of processing. Unfortunately, this is a notoriously difficult problem, and arguably, it’s simply the wrong problem formulation. Classic segmentation is exceedingly difficult: mistakes are irreversible and incorrect segments harm subsequent processing. If your kitty had its head chopped off or was permanently merged with the couch, well, tough luck. Thus classic segmentation rarely serves as a pre-processing step for detection and workarounds have been developed (e.g. sliding windows). A major innovation in how we think about segmentation occurred around 2005. In their work on estimating geometric context, Derek Hoiem et al. proposed to use multiple overlapping segmentations, this was explored further by Bryan Russell and Tomasz Malisiewicz and their collaborators (see here and here). The idea is as simple as it sounds: generate multiple candidate segmentations, and while your kitty may be disfigured in many, hopefully at least one of the segmentations will contain her whole and unharmed. This was a leap in thinking because it shifts the focus to generating a diversity of segmentations as opposed to a single and perfect (but unachievable) segmentation. The latest important leap, and the focus of this post, was first made in 2010 concurrently by three groups (Objectness, CPMC, Object Proposals). The key observation was this: since the unit of interest for subsequent processing in object detection and related tasks is a single object segment, why exhaustively (and uniquely) label every pixel in an image? Instead why not directly generate object proposals (either segments or bounding boxes) without attempting to provide complete image segmentations? Doing so is both easier (no need to label every pixel) and more forgiving (multiple chances to generate good proposals). Sometimes a slight problem reformulation makes all the difference! Below I go over five of the arguably most important papers on generating object proposals (a list of additional paper can be found at the end of this post). Keep reading for details or skip to the discussion below. Objectness: One of the earliest papers on generating object proposals. The authors sample and rank 100,000 windows per image according to their likelihood of containing an object. This `objectness’ score is based on multiple cues derived from saliency, edges, superpixels, color and location. The proposals tend to fit objects fairly loosely, but the first few hundred are of high quality (see Fig. 6 in this paper). The algorithm is fast (a few seconds per image) and outputs boxes. CPMC: Published concurrently with objectness, the idea is to use graph cuts with different random seeds and parameters to obtain multiple binary foreground / background segmentations. Each generated foreground mask serves as an object proposal, the proposals are ranked according to a learned scoring function. The algorithm is slow (~8 min / image) as it relies on the gPb edge detector but it generates high quality segmentation masks (see also this companion paper). Object Proposals: Similarly to CPMC (and published just a few months after), the authors generate multiple foreground / background segmentations and use these as object proposals. Same strengths and weaknesses as CPMC: high quality segmentation masks but long computation time due in part to reliance on gPb edges. Selective Search: As discussed in my previous post, arguably the top three methods for object detection as of ICCV13 all used selective search in their detection pipelines. The key to the success of selective search is its fast speed (~8 seconds / image) and high recall (97% of objects detected given 10000 candidates per image). Selective search is based on computing multiple hierarchical segmentations using superpixels from Felzenszwalb and Huttenlocher (F&H) computed on different color spaces. Object proposals are the various segments in the hierarchies or bounding boxes surrounding them. Randomized Prim’s (RP): a simple and fast approach to generating high quality proposal boxes (again based on F&H superpixels). The authors propose a randomized greedy algorithm for computing sets of superpixels that are likely to occur together. The quality of proposals is high and object coverage is good given a large number of proposals (1000 – 10000). RP is the fastest of the batch (<1 second per image) and is a promising pre-processing step for detection. So what’s the best approach? It depends on the constraints and application. If speed is critical the only candidates are Objectness, Selective Search or RP. For high quality segments CPMC or Object Proposals are best, the bounding boxes returned by RP also appear promising. For object detection, recall is critical and thus generating thousands of candidates with Selective Search or RP is likely the best bet. For domains where a more aggressive pruning of windows is necessary, for example, weakly supervised or unsupervised learning, Objectness or CPMC are the most promising candidates. Overall, which object proposal method is best suited depends on the target application and computational constraints. Below is a list of additional papers on generating object proposals. If I missed anything relevant please email me or leave a comment and I’ll add a link! Shape Sharing for Object Segmentation. J. Kim and K. Grauman. ECCV 2012. SCALPEL: Segmentation CAscades with Localized Priors and Efficient Learning. D. Weiss and B. Taskar. CVPR 2013. Learning a Category Independent Object Detection Cascade. E. Rahtu, J. Kannala and M. Blaschko. ICCV 2011. Fusing Generic Objectness and Visual Saliency for Salient Object Detection. Chang, K. Y., Liu, T. L., Chen, H. T., and Lai, S. H. ICCV 2011. 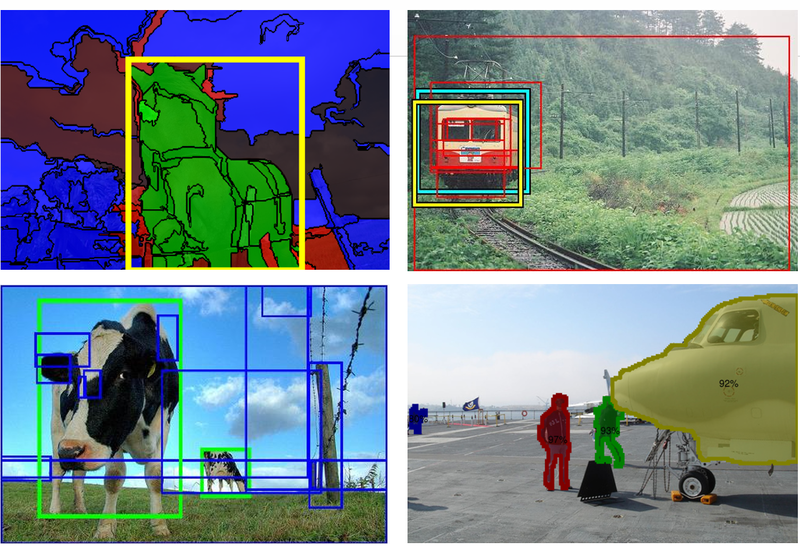 Scalable Object Detection using Deep Neural Networks. D. Erhan, C. Szegedy, A. Toshev and D. Anguelov. arXiv 2013. Generating an edge map at 30fps might not be enough. If the proposal generation algorithm is expensive or if the per-segment feature computation is slow, the entire object detection pipeline will still be slow. Do you have any ideas on how the underlying computations in your ICCV 2013 paper could be used as features for an object detector? In other words, maybe the work you are doing to get the edges could also benefit the learning algorithm used in detection. Keep the posts a comin’. @Tomasz: the features Piotr et al use for the edge detector are pretty much the same as ones they use for pedestrian detection (http://vision.ucsd.edu/~pdollar/files/papers/DollarPAMI14pyramids.pdf), with one important difference: for object detection one needs to compute features at many scales, whereas for edge detection it’s usually one or maybe a couple scales. Even with approximation tricks, you’ll end up needing additional feature computation on top of what you need for edge detection alone. Still though, Piotr has gotten feature computation to be blazing fast, and he didn’t even tap into GPUs… I don’t have a good sense of how big of a bottleneck the proposal generation algorithms are, but if they can be made fast, I think this whole pipeline would be pretty efficient.